Iguana Mexican Grill is a name familiar to most who live in or around Oklahoma City. Iguana has been around for about a decade, but has a new vibe to surprise you with. Tucked into 9th Street off Automobile Alley, Iguana is packing a new punch. Throughout January, Iguana closed for a brief stint to revamp their space and menu. OKC's taco and tex-mex competition has been upping it's game recently. I applaud Iguana for taking this as an opportunity to stay in the game instead of sinking to the bottom. After seeing Sara Kate share this spoiler a few weeks ago on Instagram, I was even more anxious to see what they had done with the space. I've enjoyed Iguana as an easy spot for dinner, the occasional brunch, even a few events. Last week I stopped in for lunch to see what they had to offer post-revamp. Right behind the hostess stand you are greeted with a bright pink neon sign reading "Make Tacos Not War." I now want this for my bedroom. They removed the wall blocking off the bar area, creating a more open space with a community table and bar stools, perfect for happy hour. We were seated in the original and main dining room, taking a seat at the banquette they created all along the east wall. Little aztec print pillows were scattered along the booth seat. The revamped Iguana is full of pink, turquoise, bright blue, lime green and other bright and playful colors. The food dishes now equally represent those colors too. I took my trusty eating partner, Kathleen, knowing that she would be more than happy to share and take bites off each other's plates. Not that guacamole isn't always great, but I'm on a guacamole kick right now. Salsa, sure, queso, I'll pass, I just want the guac. 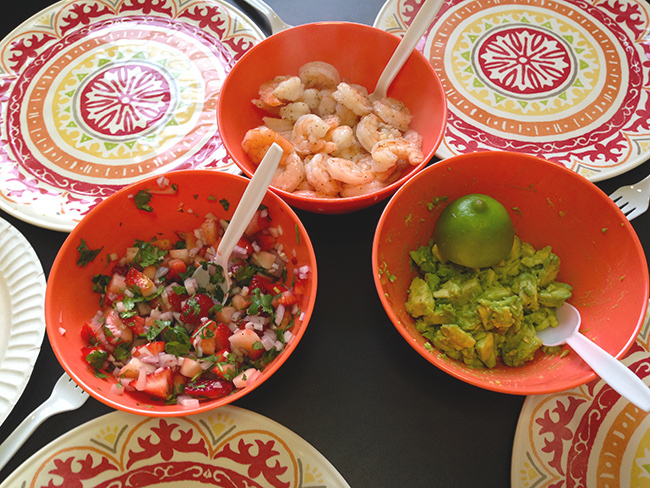 Iguana's GM, Ross, brought out a sampler of guacamoles with all different toppings. Kathleen loved the pineapple, I loved the smoky pepitas. For our entrees, I splurged a bit and got the chimichurri chicken with lime rice and veggies. I purposely got a bigger entree knowing my fridge was empty and that my leftovers would be perfect for dinner #noshame. Kat got the fish taco "a la tuma" style with refried black beans and jalapeño cheese corn bread. What's a la tuma you ask? Named after an Iguana employee, they take the taco tortilla, but first sprinkle cheese directly on the flat top, put the tortilla over it, let the cheese get barely crispy then flip it over and fill the taco. The lunch menu averages around $10 a dish and serves perfect portions for lunch and Mexican food, for that matter. The updated menu is a foodgrammer's dream. So much color and so photogenic. The old Iguana fell into the brown, tan and yellow spectrum. The new Iguana is bright, vibrant and flavorful. Colorful food typically leads to better taste too. At least in my opinion! The food, decor and service were all what I hoped for. Big ups to our server Alex who was as great as our meal! But make sure to take a bathroom break to check out this adorable wallpaper! And since sister is pregnant, churros for dessert. I have to be honest I refrained to keep from going into a sugar coma and falling asleep during the remainder of my work day. But by her facial expressions and sound effects, I could tell they were delicious! Has it been a while since your last Iguana visit? With lunch, brunch, dinner, happy hour specials 2-7PM, $1.50 tacos on Tuesday's, catering and events, they have so much to lure you in. Take a peek back to see all the positive changes they've made! I love a good taco salad. My mother really loves a good taco salad. Mom if you're reading, I'm thinking of you with this one! Last week my foodie friend posted a picture of a quinoa taco salad. You'll remember Noel from her amazing black bean burgers she guest posted on TAB. I was in mid bite of my quinoa fried rice, but instantly wished I was eating her Mexican dish instead of my Asian dinner. 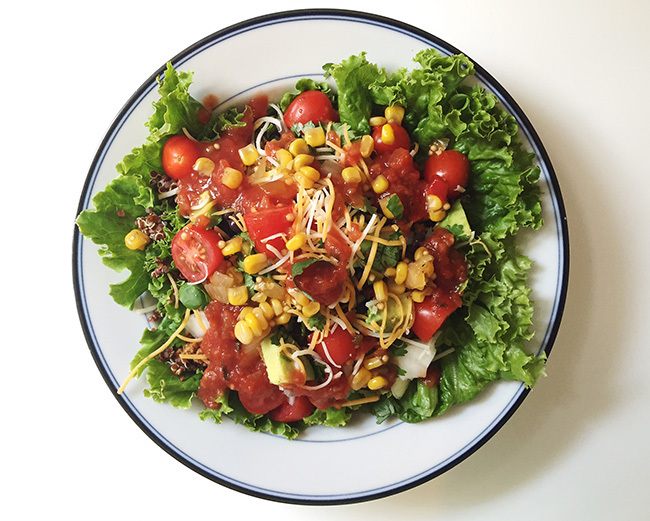 With tons of leftover quinoa from my fried rice I made sure to pick up some taco salad accompaniments at the grocery store this weekend to recreate her creation. 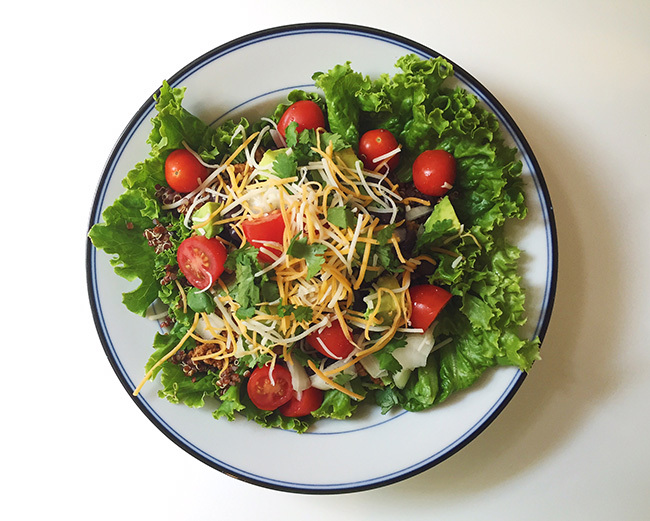 I love love love this healthy version of a taco salad. Layers of quinoa, ground turkey, black beans and loads of veggies and cheese! Cook your quinoa according to package directions or use leftovers from your Quinoa Fried Rice! Over medium heat, brown the ground turkey. Drain the grease then add in taco seasoning. While your turkey is cooking, heat the black beans in a sauce pan over medium high heat. Chop your veggies and get all your toppings ready to assemble. Start with a base layer of romaine. Work up from there with a layer of quinoa, then ground turkey, then black beans. Load on all the avocado and cheese and salsa you desire! I was so excited to be moving into a dorm with a little kitchenette. I pictured myself cooking dinner most nights and baking up some treats every once in a while. First off the kitchenette is tiny, not a huge deal, but I also can barely figure out how to use anything. Second off, I didn't even think about not having pots and pans or just the basic ingredients you need to make anything. That being said, I was still determined to cook something. Last Saturday, after a week of eating out for every meal, I decided it was finally time to cook. 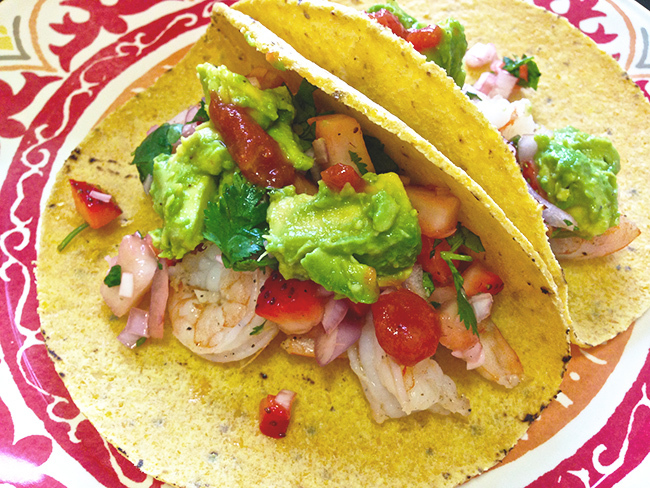 I decided to make Strawberry Salsa Shrimp Tacos, adapted from How Sweet It Is. The meal was actually super simple and totally manageable to make in the baby kitchen. We did frozen shrimp, thawed and then roasted in the oven. The strawberry salsa consisted of strawberries, cilantro, red onion and lime juice, then topped with some avocado! I bought foil to make a make shift roasting pan and got a $9 kitchen knife at whole foods to chop up the ingredients for the salsa. I made due and it actually turned out great! So if you ever are in limited cooking quarters, this is the meal to make! It was easy, summery, and won over all of the roommates! First make your salsa so the flavors have time to marry together. Chop up all your ingredients, squeeze lime over the top and sprinkle with salt and pepper. Mix together and keep in the fridge while the shrimp cooks. Preheat your oven to 400 degrees. Place your shrimp on a roasting pan or cookie sheet in a single layer. Drizzle about 2 Tbsp. olive oil over the top and sprinkle with salt, pepper and chopped garlic. Toss them around then roast in the oven for 8 minutes. Warm your tortillas in the microwave for about 30 seconds, then everything is ready! Let your guests put their tacos together as they please!